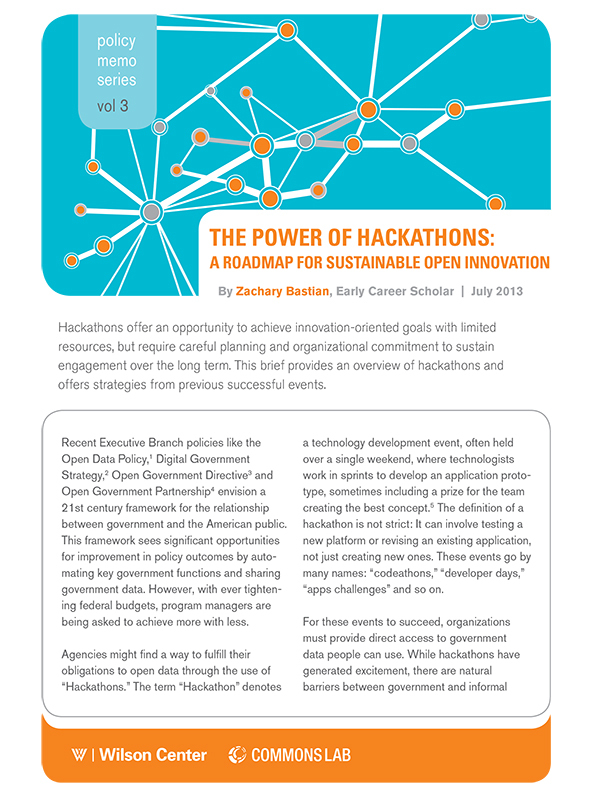 The Commons Lab of the Science and Technology Innovation Program is proud to announce the release of The Power of Hackathons: A Roadmap for Sustainable Open Innovation. Hackathons are collaborative events that have long been part of programmer culture, where people gather in person, online or both to work together on a problem. This could involve creating an application, improving an existing one or testing a platform. In recent years, government agencies at multiple levels have started holding hackathon events of their own. For this brief, author Zachary Bastian interviewed agency staff, hackathon planners and hackathon participants to better understand how these events can be structured. The fundamental lesson was that a hackathon is not a panacea, but instead should be part of a broader open data and innovation centric strategy. The full brief can be found here. Zachary Bastian is a Legal Fellow with the Office of Strategic Policy at the Federal Communications Commission. He was formerly an Early Career Scholar with the Commons Lab and the Science & Technology Innovation Program at the Wilson Center, a member of the New York State Bar Association and a graduate of George Washington University Law School. He previously worked in the U.S. Senate studying policy and supporting the work of personal and subcommittee offices. His interests include intellectual property, communications and leveraging technology to support better government.